Min Yuan & Laurine get hitched! Take some contemporary flair, a touch of vintage detailing and a generous splash of red and champagne hues and what do you get? You get the super fun, in the moment photos from Laurine Pereira and Min Yuan’s wedding. Red, white and champagne roses formed the backdrop to this gorgeous union! The day before the wedding our lil' nook was practically spilling as we used every pail in store to hold these blossoms; carefully willing them to bloom just right and just in time for the big day. Sean the best man ensures Min Yuan looks just perfect as he pins the boutonniere of a single red rose nestled against hypericum berries. We love behind-the-scenes moments such as this. Min Yuan awaits the arrival of his lovely bride. Laurine Pereira carried a bespoke hand tied bouquet of crimson roses adorned with faux diamond pins and wrapped in vintage lace. (There was a collective 'awww' in the flower shop when we finished making this bouquet). All nine bridesmaids carried hand tied bouquets of champagne roses finished with a satin wrap and pearl pins. Laurine walking into church with her dad. When we post the video look out for the sweet moment during the father-daughter dance. Pretty maidens with their champagne rose posies! ... and the groomsmen match the girls with a stylish pose of their own. Adorning the gentlemen's suits were boutonnieres of cream roses with a touch of baby's breath. Thanks Laurine and Min Yuan. Best wishes and happiness always from your floristas! Description: Coconut husk basket filled with premium Mariami dates, date delights and chocolate dipped dates. Description: Basket filled with Mariami Dates, Date Delights, Stuffed Dates and Eid Delicacies. Description: Fuchsia weaved basket is filled with premium Mariami dates, Turkish delights, date delights, baklavas, chocolate dipped dates, Jordan almonds, assorted teas, Eid delicacies and imported Moroccan lantern. Description: Contemporary leatherette and linen box is filled with premium Mariami dates, date delights, assorted stuffed dates, chocolate dipped dates and chocolates. Description: Basket filled with date delights, Turkish delights, Jordan almonds, baklava, Eid delicacies, chocolates, stuffed dates, sparkling juice, premium Mariami dates and imported Moroccan lantern. Description: Hand embossed metal box is filled with date delights, Turkish delights, Jordan almonds, baklava, Eid delicacies, chocolate dipped dates, chocolates and imported Moroccan lantern. Description: Raya Gift Box box filled with baklava, assorted chocolates and Eid delicacies. Description: Chest filled with Turkish delight, baklava and chocolates. Description: Ramadan gift set gift box filled with premium Mariami dates, date delights, assorted stuffed dates, chocolate and dipped dates. Contents: Turkish delight, baklava, chocolates, date delights, chocolate dipped dates, Jordan Almonds, Eid delicacies and imported Moroccan lantern presented on a table. Table not sold separately. Description: Turkish delight, chocolates, chocolate dipped dates, Jordan almonds, Eid delicacies and imported Moroccan lantern presented on a table. Table not sold separately. Description: Crocodile chest is filled with premium Mariami dates, date delights, Turkish delights, Jordan almonds, chocolates and imported Moroccan lantern. Description: Chest is filled with premium Mariami dates, date delights, Turkish delights, Jordan almonds, Baklava, Eid delicacies and imported Moroccan lantern. Description: Large chest is filled with premium Mariami dates, date delights, Turkish delights, Jordan almonds, baklava, Eid delicacies, chocolate dipped dates, chocolates and imported Moroccan Lantern. Description: Date Delights, Turkish Delights, Jordan Almonds, Baklava, Eid Delicacies, Chocolates, Chocolate Dipped Dates and imported Moroccan Lantern. Description: Date Delights, Turkish Delights, Jordan Almonds, Baklava, Eid Delicacies, Chocolates, Chocolate Dipped Dates and imported Moroccan Lantern. Container not sold separately. Description: This table has been laden with the perfect delicacies to break your fast with. Filled with premium Piarom Dates, Assorted Stuffed Dates, Date Delights and Eid Delicacies. Description: A feast for the festivities, this table holds an array of goodies that that can be enjoyed by a whole family for days. It holds assorted chocolates, baklavas and Eid delicacies. Table not sold separately. Description: Lilac leatherette hamper filled with baklavas, Jordan almonds, Turkish delight assorted Eid delicacies and imported Moroccan lantern. Description: Baklavas, Jordan almonds, Turkish delight assorted Eid delicacies, assorted chocolates, Mariami dates, assorted tea, sparkling juice and imported Moroccan lantern. Description: Leatherette Bag is filled with Baklavas, Chocolates, Mariami Dates, Date Delights and Moroccan Lantern. Description: Baklavas, Chocolates, Turkish Delight, Assorted Tea, Eid Delicacies and Moroccan Lantern. Description: Baklavas, Turkish Delight, Mariami Dates, Date Delights, Sparkling Juice and assorted Eid Delicacies. 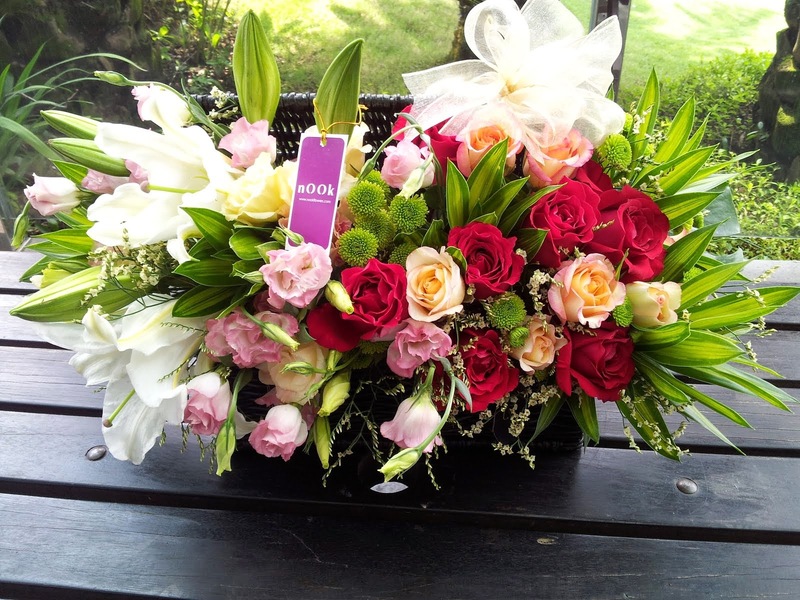 For details, please call 014 368 1044 or email to info@nookflowers.com. Due the nature of the items, pre-booking (at least 3 days) is required.